The Racecourse of Paulus | The honorary wreath! There are many Christians, amongst them also Pastors and Elders, in the congregation of the Lord who are fasting and praying under great aspiration, because the Rebirth cannot be found. I once spoke in 1988 with an elder from my previous church “The Bethel” in Arnhem (The Netherlands) and asked him whether he had been born again out of the spirit. Immediately I could read the disappointment on his face, because he was already 80 years old. He knew who I was, a Son of God and a speaker about the Rebirth. He had been searching for 50(!) years for this mystery. I was very sad when I heard his story and have prayed for him and brought him details, how to obtain the right insights to get this mystery. But unfortunately, death overtook him. He is now a beautiful angel in the armies of God the Father. See the singer, Bob Dylan! He has converted his heart and was baptized. He is a true Christian in God. But when one of the journalists (a Christian) asked him whether he had been born again, he had to admit he was not. Already more than 36(!) years passed and he is still battling with himself when it comes to the Rebirth out of the spirit. After his conversion in aug.1979, he released his long-awaited LP/CD: “Slow Train Coming”. This was his first Christian album. When it concerns the Rebirth, one is totally dependent on the Holy Spirit.“Yet to all who received Him, to them gave He power to become children (sons) of God…” (Joh.1:1­2) This power is the Holy Spirit. To avoid confusion, I first write a few experiences on what this Rebirth of the spirit certainly is not. Because it not so easy to obtain the sonship of God. 1) The ordinary conversion and all those who have conquered their conversion through trouble and doubt, because Jesus surely saves man from his earlier views. 2) Underwater baptism, only valid while fully immersed. 3) Being freed from his sins or be freed from demons with the help of Christians and the Holy Spirit himself. See: (Matth.12:28) “But if I cast out devils by the Spirit of God, demons, then the kingdom of God has come upon you.” This is not the Rebirth. 4) The ability to speak in tongues or in several other languages, with or without translation. 5) The ability to prophesy (prophecies) or other gifts. 6) The ability to see and talk with angels. All this can only be experienced after a conversion. But the Rebirth, the sonship of God is thus not yet obtained. In other words, the Rebirth of the spirit is an experience that surpasses a conversion many times, one can say 1000s of times. Although these mentioned experiences are already seen as miraculous by the convert and can influence and completely control his life, without a previous warning, he will never know, or suspect that, to him or her, the Rebirth out of the spirit has not yet occurred. 1) Can you still remember the day of your conversion? 2) How many months or years later were you baptized? 3) How many years after the underwater baptism have you come to an understanding of the Rebirth? See: (Ephes.6:10-20), (2 Petr.2:10), (Rev.3:18) and (Rev.12:2) Trial by fire! 5) How long have you been praying for this mystery (John 1:12), before you could be reborn out of the spirit through Trial by fire? 6) Then the experience itself! What were you thinking, at the time the Trial by fire broke out? 8) How many months or years later, after the Trial by fire, you have come to the full awareness of the Rebirth? Please refer to (Rev.2:26-28). A Giant wakes up! 9) Did you give a testimony on this mystery afterwards? To whom did you tell, to a convert, to a Deacon, to a preacher or to a pastor? How did they respond and what were their opinions? Peter, in the 1st degree of his knowledge was already more than converted. But insights into the 2nd degree he could not yet understand by then. He had to wait for the coming of the Holy Spirit. According (Matth.11:12) are all these Forces and Powers, who manage to handle in the 2nd and 3rd degree of Fire knowledge, that no one among the Christians who live in the 1st degree of their ability, can tolerate. This child represents the Sons of God. And many of them have the iron rod! The iron Rod can only be carried by a Son of God and by the Oalim and must be obtained separately and does not come together with the achievement of the Rebirth of the spirit. This is a very great merit that only can be achieved by another trial and struggle. The iron Rod must be obtained separately! The Bride is not in the running for the iron Staff. She lives in love and is not a warrior of God. With the Rebirth out of the spirit two types of forces are born; one is born in love and the other is a warrior of God! This one is a Son of God, pursuing the law with love and determination. Only a warrior can achieve the level of Oalim. Practically nobody among the converts can see this mystery so easily. If you have never known anything about this, where will you start? The Rebirth out of the spirit is a rare experience and cannot be achieved by every Christian. Out of 1000s, there are at most a few who can achieve this level. During 1988, I was in a Full Gospel Church “The Bethel” in Arnhem (Netherlands), a church of mostly Indonesian people. Out of ±800 Christians were but five Christians who were reborn out of the spirit. 5(!) Sons of God from a community of 800 Christians, that is really a lot! It is almost unbelievable. And as long as this church has existed, it has only brought forth one Bride, truly. And this was the wife of the pastor himself. I saw this fact at first in 1990 when I walked up to her. Immediately I told her that she was the Bride of Jesus. She was amazed because she had not told anyone, not even her own husband! Nobody knew. I then told her all the details that concern the Bride of the Lord and never before she heard such beautiful things. It is also not mentioned in the Bible. Everything I had told her was what she had been through. She would at long last obtain seven(!) Thrones, before she herself was picked up by the Lord. A Throne is a King’s Mantle. Think of the King’s Mantle of our Dutch King Willem Alexander. A King’s Mantel with many Lions embroidered in it. It’s very impressive! And she, the Bride of the Lord, obtained seven(!) different Thrones. This woman is the Bride of Jesus. Clothed with the sun means; she is born again out of the spirit. The meaning of the moon indicates; that man finds himself very beautiful. The twelve stars above her head, stand for the twelve commandments of God. These are the Ten Commandments of Moses and another two commandments that Jesus has added. In total twelve commandments. Inside the church of the Lord the legacy (sonship) of God is hidden. “Yet to all who received him, to them He gave power to become children (sons) of God to be…” (John 1:1-2). Eq. (1 Peter 1:12), (John 3:3-5), (2 Peter 1:10), (Titus 3:5-7) and (Rev. 2:26-28). This particular experience has lasted for almost 2,000 years and can only be achieved on Earth! For only through the power of the Holy Spirit it can happen that the convert can be overwhelmed through the understanding of the Rebirth out of the spirit in such manner, that all previous obtained experiences will pale into insignificance! This finish means the Rebirth out of the spirit. This is not about one person, but about many converts, all of whom will win the first prize! This price is obtaining the sonship of God. A Son of God after his transition, immediately takes matters into his own hands again. It is the spirit that recognizes itself again. But now in the form of a Son of God or even the Oalim! Everything from the past, all his thoughts, what he has experienced and knew, over billions of years, will be given back to him. And that is something that does not happen with an angel. And his resembles of the past will hardly recognize him again. They are all new angels. One can be from Earth and the other can be a primal angel, because they are all angels. All they know is that this change has begun on Earth and that, in consequence, they have been renamed. After 40 years, the convert has made such a progress in the Sanctification that he has become an angel. Of all his memories, such as his youth and life, finding God the Father and Jesus, he will not know more than that he was born on the planet Earth and as such comes from there. Converts having one or more Pounds (work), but without understanding (2nd degree) or any belief in Rebirth, they are being alongside the racecourse. For he who enters the racecourse, will perform something. A convert steps into the racecourse. They are still all randomly mixed together. All these converts have not yet received any insight, but already know that they have not been born again out of the spirit, and they are already on the racetrack! The racecourse gives them some assurance. Therefore he stands already on the right track. But, when is the go-ahead to run? Only when a convert obtains the insight (2nd degree) of the Rebirth, the race has begun and not before. Because this understanding is the go-ahead and the Holy Spirit is his guide, trying to keep the rider on the right track. Everyone starts for himself when the time comes. But the finish is invisible to the runner himself. Everyone runs for himself and when the time has come, he himself determines the finish line. For where is the finish line and how long is the race track? Jesus had enough with one day. After His water baptism, that same evening, He experienced the Rebirth out of the spirit! And so He became the firstborn Son of God the Father. Another requires several days, weeks or a month. I ran this race course in three months. Another will take a year or even longer. And yet another does it in 40 years! You can see now how long this race course can be for very many of those who started the race by the power of the insight of the Rebirth! Here Paul encourages all true Christians of God, to do their level best and achieve the Rebirth (sonship of God). For they run, but not everyone reaches the finish line. Many have to give up before time because of the length of their lives. And the finish of the Rebirth is gone forever. However, the kingdom of heaven is already achieved. And all these converts are like the angels. Outside of the stadium are those who do not have the insight of the Rebirth (the big school children) and did not want to believe that they yet have to be born again out of the spirit. They think all has already been achieved. (Rev.3:17) They even think to be the Bride of Jesus! It’s all for free, they say. You just have to believe it. However, they are surrounded by Demons and Devils, who keep a close eye on them! All these stubborn converts know nothing of a stadium and of a racecourse. Because only herein the finish line of the Rebirth can be achieved. Whoever comes to understanding outside the stadium and comes to believe that with him indeed Rebirth has not yet been found, he (the convert) steps directly inside the stadium and finds himself suddenly in the midst of all the other converts who have the same faith. They interchange thoughts and discuss how to obtain this mystery. If through such a conversation one comes to insight in the 2nd degree, he automatically enters the racecourse and he has also started the race. In case a convert out of the stadium also obtains the insight in the 2nd degree he is admitted immediately at the racecourse and starts the race at once. The moment of Trial by Fire! The inheritance only concerns the mystery of the Rebirth to obtain the sonship of God. See some more knowledge in the second degree. Nicodemus was also overtaken by it. So you should not be surprised with the following. The “Bride” enrobed with the power of a sun emanates from the 2nd degree. The “Bride of the Lord” emanates from the church of God. See (Revelation 12:1). The level of the ‘Oalim’ is greater than that of the Bride. The Oalim is the highest level in the 3rd degree achieved by the Sons of God. The Oalim has a power of 1000(!) suns. Whoever achieves this level, will be called the Lion of the Abedam. Jesus is the Lion of Judah. But He is also the lion of the Abedam. After all, Jesus is the Oalim. “Abedam” is one of the first names of God the Father. The ‘Oalim’ is the Morning Star. Eq. (Rev.22:16). Jesus, in the first 30 years of his life, lived in the 1st degree of His capacity. After the water baptism, still on the same evening, the Lord achieved the level in the 2nd degree by obtaining the Rebirth out of the spirit. During the next three years, the Lord had the level of 2nd degree as the firstborn Son of God. In the court of Gethsémane (one day before his death), he achieved the level of the Oalim! (3rd degree) and so became equal to the Father. For God the Father is the Oalim. Surely not everyone can tolerate this knowledge. Who can grasp it, let him grasp it. Nicodemus was the only one to whom Jesus made known the mystery of the Rebirth. The second time Jesus spoke about a small part of this mystery was when he talked with Peter. After that it has hardly been even possible to explain this mystery in full. For the converts/sheep of God, I try to write even more clearly to make the understanding of the Rebirth more comprehensible to the convert. But no matter how I prayed for some more insight, the Lord showed me always that only by obtaining an insight into the 2nd degree, the Rebirth can be seen. There can be found no other explanation outside of this that brings you to such great insight, other than to see the Rebirth. That is not possible. See how wise and spiritual Nicodemus was already and yet he was unable to comprehend what the Lord meant. Nicodemus was ecclesiastically very well studied. He was, so to say, a top theologian. A mentally higher level, at that time however did not exist. Jesus needed him for this conversation. But no matter how the Lord tried to explain the necessity of the Rebirth, Nicodemus was unable to see what Jesus meant. It is almost certain that this conversation has never left his mind. Otherwise John would not have made any note of it. See: (John 3:1-21). And whether Nicodemus has ever achieved the Rebirth is for many converts still questionable. For this mystery is hidden in the 2nd degree. And only the Sons of God know that Nicodemus, years later, indeed achieved the Rebirth out of the spirit. But it is important to know that he had enough insight to see that in case of a possible doubt about his conversion, at least he was saved through Abraham. I am sure that Nicodemus, after the outpouring of the Holy Spirit, saw a total evidence of what his conversion was and more what the Lord wanted to tell him about the Rebirth. He was very astonished when he achieved the Rebirth out of the spirit. The Lord did not say that Nicodemus was lost. Why did the Lord only spoke to Nicodemus about the Rebirth and why not to all his disciples, or at least one of them? Nicodemus was the only one who was aware of all the writings of the Old Testament, only he would be able to understand the Lord. How surprised must have been the Lord with this conversation. Nicodemus did not make it, with what Jesus meant (John 3:4). What the Lord then said to bring Nicodemus to a common understanding is really unbelievable. In brief: The Son of God (2nd degree) goes his own way and a convert (1st degree) is no longer able to follow him. Nicodemus understands still pretty good, but a big school boy protests straight away! Jesus: “Verily, verily, I say unto thee, we speak what we know and we testify what we have seen, and ye receive not our witness.” The Lord means by “we”, first told by Jesus Himself and then again by others, who later on will and would speak on this subject, namely The Sons of God. In (John 3:11) The Lord pronounces 4x the word “we”. Nicodemus was not able to capture the explanation that the Lord gave him. The Lord could not have such a conversation with any one, only with Nicodemus. He was also the only one who might probably understand this, but alas. Rebirth out of the spirit is no Gospel but a warning! “Verily, verily, I say unto thee, Except a man be born again, he cannot see the kingdom of God.” (John 3:3) Each evangelist has a special gift and way to announce the gospel. But no matter how I try to explain to a convert about the Rebirth, yet to be achieved by him, like this it is no gospel, but rather a warning! Jesus: “I told you, unless you are born again out of the spirit, etc. etc.” These also have become my words now. Many converts think that first all their questions should be answered before they want to believe. Annoyed by this warning they grumble against it in a childish way. “Who are you, what is your work for the Lord, how long do you already know the Lord, do you know that Satan also can indoctrinate?” etc. etc… How often have I not passed through this already? It is not so easy to speak about the mystery of the Rebirth. It is therefore truly no gospel anymore, but a reprimand to your address, that without the Rebirth out of the spirit, someone can certainly not enter the Kingdom of God. Why should a warning be given? Well, it shows in the way the Lord speaks to Nicodemus. The Lord is even surprised that this spiritual academic is unable to see through this Rebirth that is so important to Jesus. Of course the Holy Spirit was not yet present to make him understand about the spiritual details of Rebirth. This however became possible after the coming of the Holy Spirit. Despite many Bible studies, the leaders are becoming characterized by repetition. It becomes explained increasingly finer, though. But no spiritual progress is made in order to achieve understanding. If you hear how much they all know, you would wish you knew just as much of the Bible. But if you suddenly start talking about the Rebirth out of the spirit, they all look at you dumbfounded. And then there is their great knowledge of the Bible, which can no longer recognize this necessity of Rebirth. 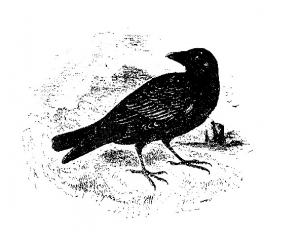 This verse means that the going out and coming again of the raven reflects the mind of a convert. In fact, he finds himself in dense clouds fields in the degree in which he thinks and lives, namely, the 1st degree of his conscience. That is because he cannot know anything about the mystery of Rebirth yet, only that which is revealed in the Word of God, in which everything is described in general terms. As a spiritual man knows only the generalities of the Bible, it is clear that numerous confusions are adding to it and imperceptibly creep in. This knowledge cannot be scattered. The mystery of the Rebirth therefore goes against any knowledge of the 1st degree, which is his conscience. They have the Holy Spirit and many even speak the language of the Lord. They are all converted and have experienced the Holy Spirit through water baptism. They live in the strength of their capacity, which they automatically defend in the 1st degree of their level. Either way, they are right and through these clouds fields around them, the 2nd degree higher indeed cannot be seen. Through the power of the Holy Spirit, the truths of faith enter, as the first rays of light, and only in this light, he knows his peace. But it is not the Rebirth out of the spirit. All texts are taken from King James Versions and supplemented by prophecies according to (John 16:13).